At the heart of Yogic philosophy, practice and application of the tools of Yoga, lie the intertwined Triguṇa – Sattva, Rajas and Tamas, that are always in flux and thereby, manifest changes within and without. While Tamas, when at the appropriate level, gives stability, appropriate level of Rajas enables all movement, gross and subtle. Sattva is associated with light, lightness, lucidity and illumination. Sattva dominance is desired and strived for. However, when Rajas or Tamas overpower and dominate, they catalyse a domino effect process that proves detrimental to physical, physiological and psychological wellness. Since time immemorial, our masters venerated objects of light, seeing in them not just the symbolism of removing darkness but also practically the effect of the sun, moon and fire that nurture and cleanse in unique ways. They also perceived and experienced a deep connection between external objects of light and the minute but eternal flame of the soul within. In celebrating that connection, they explained, lay the secret of health, longevity and spiritual growth. 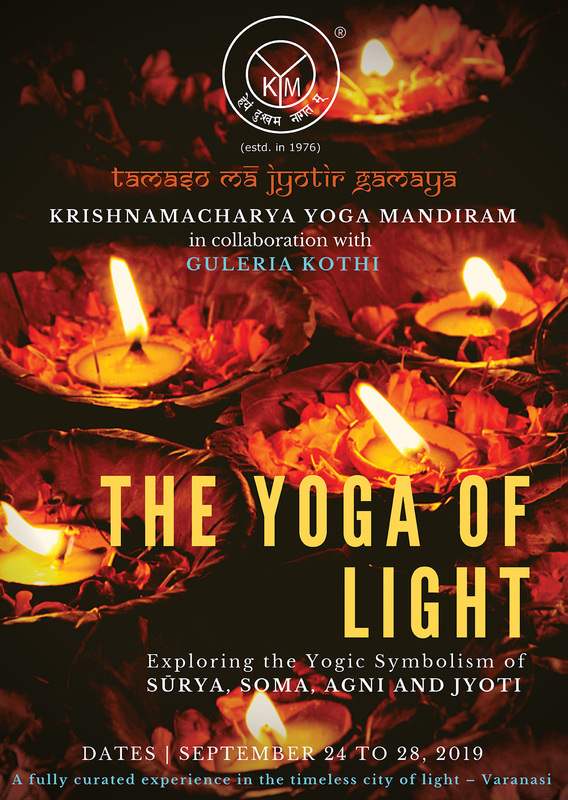 In this fully curated meditative retreat held at the timeless city of light, Kashi, participants explore the Yogic symbolism of the sun, the moon, fire and the lamp, with integrated experiences of chanting, Āsana, Prāṇāyāma and meditative practices on these themes. Also included as part of the meditative experience are a sunrise boat ride along the Ganga, the sunset Arati that Varanasi is world renowned for, a visit to the Bharatamata Mandir, a silent morning walk along the ghats and an experience of the sacred ceremonial fires of Dadhaswamedh ghat. There will be some time set aside for personal sightseeing or visiting the local temples. KYM is delighted to collaborate with Guleria Kothi, a 16th century palace that has been refurbished as a luxury four star hotel. We are fortunate to have a beautiful space for practice, presided over by a unique 13th century Vigraha of Lord Vishnu. Accommodation will be offered on a twin share basis in rooms overlooking the Ganga. Accommodation inclusive of all meals and taxes per person for 5 nights stay at Guleria Kothi will be Rs. 23,000 payable directly to the hotel on or before 31st August 2019. *Programme fee payable to Krishnamacharya Yoga Mandiram is Rs. 10,000. Participants are requested to plan their travel to reach Varanasi by lunch time on 24th September and to leave after lunch on 28th September 2019. Limited places only available on this meditative retreat at Varanasi, where the holy Ganga gently flows. Varanasi is no mere city. It is an experience.